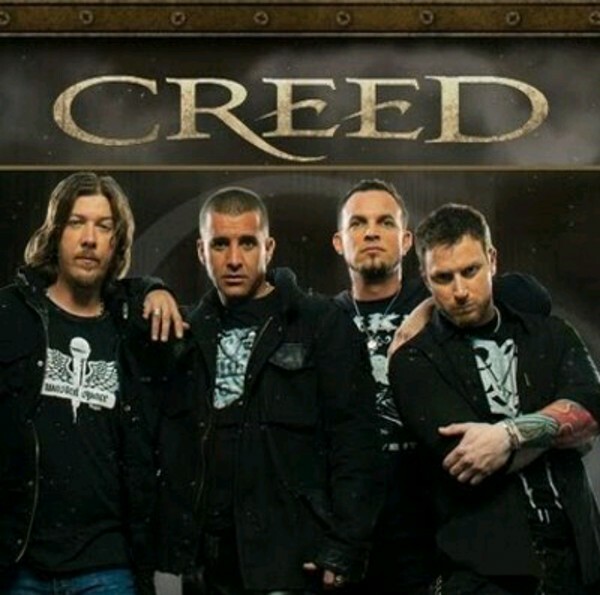 Creed (1993-2004, 2009-2012) is a Grunge band from Tallahassee, Florida, USA. reed was founded in 1994 by singer Scott Stapp and guitarist Mark Tremonti who recruited the rhythm section of Brian Marshall (bass) and Scott Phillips (drums). Although they got their rise with the grunge scene they posed no serious threat to those established within it. Their self-financed debut My Own Prison (1997) sold its initial production and made the majors sit up and take note with 'Epic' (via it's 'Wind Up' subsidiary) signing them to re-mix the original and get it a 22 US charting on re-release. Their follow-up Human Clay (1999) broke through to number 1,surprising everyone since the grunge movement had long since died away while they continued to flog the sound. In June 2004, it was announced that Creed had broken up due to tensions between Stapp and the other members, primarily Tremonti. It would take 5 years until the band reunited. In the mean time (2004), 'Wind-up' issued the Greatest Hits compilation that reached 15 on the Billboard 200. The new line-up after reunion would feature the old line-up. Weathered (2001) and Full Circle (2009) would follow. The issues between Tremonti and Stepp were not fully resolved, however, and the band split again in 2012. The compilation album, With Arms Wide Open: A Retrospective would be released posthumously in 2015.